Mary Help of Christians may soon have a new owner, and the long-standing flea market next to the church is preparing to permanently fold up its tables. 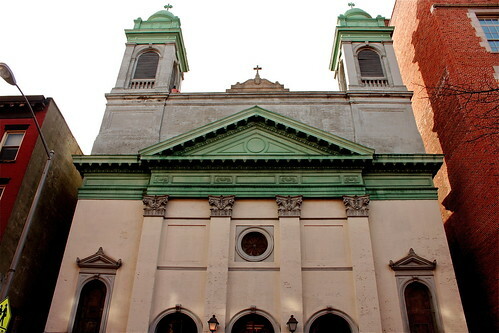 John Matcovich, the manager of Immaculate Conception Parish, which has overseen the church on 12th Street since 2007, said that a couple of months ago the Archdiocese of New York found a buyer for the church as well as the adjacent school building and parking lot; the deal is expected to be made official in September. Joseph Zwilling, director of communications for the Archdiocese, declined to confirm that a contract was in the works, citing a policy of not discussing real estate dealings until they are finalized. “The process is not over with Mary Help of Christians,” he said. Daniel Maurer A recent film shoot inside the church. During a telephone conversation today, Mr. Zwilling acknowledged that the church building, which dates back to 1918, was put on the market as a result of the reorganization of the Archdiocese in 2006, though he would not confirm that the school building (where Mary Help of Christians school closed in 2006) and the abutting parking lot were part of the parcel. Daniel Maurer Bernarda Ortiz, photographed in March. 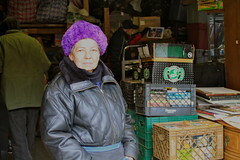 Today, Bernarda Ortiz, who has overseen the church’s flea market for 15 years, sat in the parking lot adjacent the church and the school building. This week, she began opening the lot on weekdays in addition to weekends, so her vendors can sell their stock ahead of the market’s permanent closing. Ms. Ortiz believed the flea would fold in September, but said it could be sooner, depending on when the sale is completed. The 84-year-old retiree, who has lived on Avenue C since 1979 and runs the flea market as a volunteer, said vendors who’ve been informed of the church’s sale aren’t happy about it. “They won’t have a place to sell,” she said in Spanish, adding that some vendors come in from Connecticut to rent space for $40 per day. Daniel Maurer Inside the school building. While it’s been in limbo, the church has hosted film and television shoots, including the recent filming of Boardwalk Empire, among others. 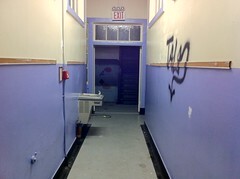 In April, The Local toured the set of one such production and got an eerie look into the long abandoned school building, which will finally be cleared out should the sale go forward.